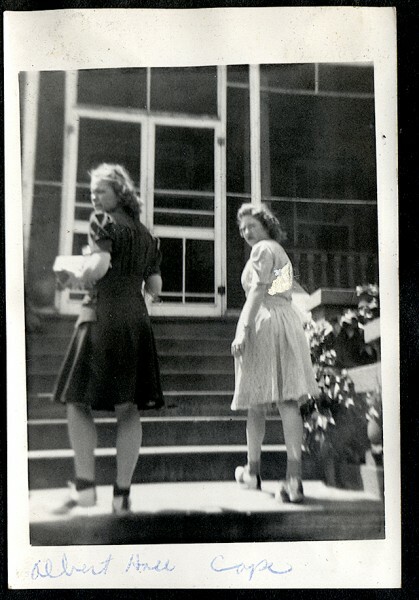 When I saw Fred Lynch’s blog with Frony’s pictures of some coeds on the steps of Albert Hall in 1960, I remembered seeing photos of those steps in Mother’s scrapbook. I wasn’t sure that it WAS Albert Hall, but that’s the way Mother had the photo labeled, and the concrete detail on the right of the picture matches Frony’s shot. Fred had another photo from 1960 showing the dorm being razed. (SEMO is great at flattening landmarks.) Fred noted that the dorm for women opened March 7, 1905. It was built by a private corporation, and acquired by the state in 1912. It served for 54 years. 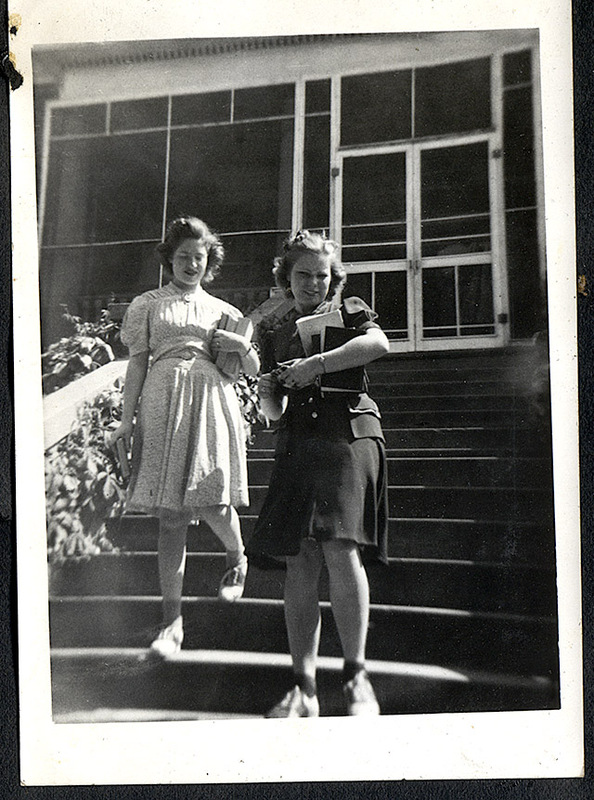 Mother graduated from Advance High School in 1938, so these photos of her friends was taken after that. So, at some point, the “new” Albert Hall was built as a boy’s dorm…right? Nobody ever does anything about the old Leming Hall, where I lived for my first two years in college. I wish I’d had the presence of mind to take pictures, inside and out. It seemed as if the building had been there forever, so I didn’t question that it be BE there forever. I didn’t know then that all the structures on that campus are subject to removal at any given moment. Well I certainly remember the demise of Leming Hall. Demolition started in the fall of 72, and since I lived across the street in Henderson House (it was a dorm back then), I had a front row seat to the action. The process seemed to take forever, there was constant noise and excavation. In the spring of 73 there was a serious flood. It looked like what was left of Leming Hall had a MOAT around it! Look at those shoes! Saddle Oxfords! I always thought they were way cool! I don’t remember Albert Hall…when was it on the campus? Of course, in 1960 a womens’ college dorm was not on my radar as of yet, so help us out here a little..
Dearmont Quadrangle at State College, it where it was…now I remember. Many fond childhood memories of Albert Hall where my grandmother was housemother for about 30 years. The back door that led to the kitchen had an electric screen that killed bugs and shocked you if you forgot and touched it!